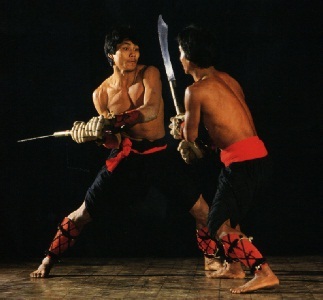 In India, the Two Best known Martial Art Traditions—Thang Ta of Manipur and Kalari-payattu of Kerala, have survived through centuries and both have a strong spiritual basis with strict moral and ethical codes. They are meant for protection and defense and are opposed to viciousness, cruelty and violence. The origin of Thang Ta is hoary and full of legends. In the beginning of time when there was absolute nothingness, the Supreme Creator, Atiya Guru Sidaba sitting levitated on his own breath, created Asiba his son, and asked him to fashion the universe. - [Guru is not an appropriate usage here; Guru means the master or teacher; but in this context the correct wording will be KURU = round hemisphere, for Atiya = the sky, Kuru = the round or circular, and Sidaba = never ending or without death, indicating the limitless hemisphere of the sky]. Perplexed as to how to fabricate anything out of a void, he inquired of his father how to go about it. At this, the Creator opened his mouth and asked his son to look inside, where he saw the whole cosmos lying dormant, yet to manifest. He was also instructed to devise a dance named Thengou using the same configuration of nerves and veins inside his father as the model for the pattern of his movements on the ground, on which the universe would rest when it was created. Thus the first act of cosmology was dance, and Thengou was the first dance, made up of a combination of martial art movements. Thengou, traditionally believed to have been originally performed by the Gods at the time of creation, forms a highly esoteric branch of Manipuri martial arts. These are sacrosanct dance compositions, performed usually by holding either a sword and shield or a spear and shield. There are many variations. The pattern on the ground is based on one of the various sacred coiled snake motifs worshipped in Manipur. There are various Thengous for bringing prosperity to the land or people, protecting the king, destroying the enemy, etc. They are performed on extremely rare occasions when a dire need concerning the well being of the country arises. The rituals involved are extremely elaborate. All the details including the auspicious moment, ceremonial offerings, purification rites, choice of place, kind of weapon, costume, movement, ground patterns and incantations, mentioned in the sacred texts are inviolable and thus scrupulously followed. It is believed that any mistake in its performance or its employment can bring untold misfortunes to the performer and his family, even to future generations. Thus only great masters with absolute proficiency, experience and pure minds perform Thengous. The gurus, very reluctant to part with this knowledge, choose only those few disciples with proven integrity and maturity. Thengou training is imparted in a secluded place, away from habitation or a sandy riverbank likely to be washed away in the next floods. For where Thengou is performed, the ground is imbued with such power that anyone desecrating it inadvertently may incur divine wrath. The training begins after sanctifying the land. The weapons are also considered to have divine origin with symbolic significance. When Til Sidaba (a powerful god) decided to give up his body, different ‘boxes' of his remains became various weapons. Swords, spears, etc., do take on varying forms resembling such boxes. Scholars have given elaborate interpretations on their significance and use. The weapon is not an ordinary object; it is energized and infused with a vital divine force and cannot be desecrated by employing it for any degrading pursuit. Thang Ta demands a great deal of self-discipline from its practitioners. It is feared that certain vices may even jeopardize those powers acquired through years of training, meditation and worship. Some types of food are also forbidden. One important ethical code mentioned in the scriptures is that even in the midst of war, one should not harm an enemy who is running away, who is hiding out of fear, who is crying out of fear and who has asked for protection. Violating any of this is considered a great sin. For a warrior, every moment of his life is guided by certain rules. Eating, sleeping and even breathing are well regulated. Martial arts training, initially, is more physical in nature, but as one advances, it is more spiritual. The secrets of yantra, mantra and tantra are gradually revealed to the student. The warrior's main and only concern ought to be the protection of the land, people, king and the weak. This sense of selflessness cannot be better symbolized than the costume which he wears to war. It includes a sacred cloth usually worn by the dead, thus preparing him for the supreme most sacrifice. In actual practice, however, all these branches are interrelated and one cannot be completely free of the other. The aesthetic or dance aspect of the martial arts of Manipur demand a great deal of balancing and body control. Dancing skills add exterity in wielding the weapons. In fact, this has greatly influenced the dance traditions of Manipur. In our times, many dancers incorporate the martial dances, enriching their repertoire with great effect. In the combat part, the training is extremely thorough and demanding. It makes a person physically and mentally so alert and well integrated that he becomes virtually impregnable. At the same time he is also packed with tremendous striking power. A trainee usually specializes in one weapon though he must learn the use of all the main ones. Thang-Ta is the term used to represent all of the Manipuri martial arts. Thang-Ta literally means "sword and spear" because these are the mains weapons used, however, other weapons are used as well, including shields, daggers, sticks, and axes. The Manipuri people have a long history of combat. Their methods involved specific elements of etiquette. For example, if an unarmed man was challenged to do battle, he was given time to obtain his weapon(s) before engaging in a fight. Another example involved combatants who used spears to do battle. These warriors would agree on a set distance between them. When this distance was reached, the two rivals would begin to throw spears at each other. Receiving even a small scratch was enough for a participant to lose this dual and the defeated man would bravely accept death as his fate. Many times before he would die, he would share a meal with the victor. By allowing himself to be executed, the vanquished warrior was actually following what he believed to be God's laws, the violation of which would be viciously avenged. The arts of Thang-Ta are serious forms of self-defense, even aggression, now choreographed into well-performed movements on stages. All performances of Thang-Ta often differ greatly from one another, yet they are executed with the utmost skill and precision. Anything less would result in the injury, or even death of one, or both of the participants. Thang - ta & Sarit - Sarak : The history of Thang - ta and Sarit - Thang - ta involves using a sword or spear against one or more opponents. Sarit - Sarak is the technique of fighting against armed or unarmed opponents, but on many occasions there is a combined approach to the training of these martial arts. These martial arts were used with great success by the Manipuri kings to fight against the British for a long time. With the British occupation of the region, martial arts were banned, but post - 1950s saw the resurgence of these arts. Thang - ta is practiced in three different ways. The first way is absolutely ritual in nature, related to the tantric practices. The second way consists of a spectacular performance involving sword and spear dances. These dances can be converted into actual fighting practices. The third way is the actual fighting technique. The Sarit - Sarak art of unarmed combat, is quite distinct from other martial art forms. It is simply flawless in its evasive and offensive action, as compared to any other existing martial art of the same school. Legend has it that Lainingthou Pakhangba, the dragon god - king, ordained King Mungyamba, to kill the demon Moydana of Khagi with a spear and sword, which he presented to the king. According to another such legend, God made the spear and sword with creation of the world. This amazing wealth of Manipuri martial arts has been well preserved, since the days of god king Nongda Lairel Pakhangba. The fascinating Manipuri dance also traces its origin from these martial arts. The proper name for Thang-Ta is HUYEN LALLONG ("method of safe-guarding"). As the name implies, Huyen Lallong is more than just the training of fighting skills. It is an elaborate system of physical culture that involves breathing methods, meditations, and rituals. Some of the sword and spear forms are entirely ritualistic, although they are composed of material techniques. They are to be performed only at special occasions or under special circumstances. For example, there is a spear form that is performed at funerals. Perhaps the most famous form is the ritual spear dance done by King Bhagyachandra (ruled 1759-1798) on a mountain top during his exile due to the Burmese invasion in 1762. The Manipuris believe that the ritual was instrumental in driving the Burmese out of Manipur. The heart of Thang-Ta is the "sword". There are literally hundreds of different sword drills for training the basic strokes and stepping patterns. Many are two person sets, but others may be practiced solo, at least initially. The Thang-Ta spear forms are more complicated and must be seen to be appreciated. "Many are the warnings given by the old teachers to their students who, they say, may seriously injure their limbs by incorrect stepping according to the design - PAKHANGBA, a coiled serpent motif", wrote Louis Light foot (1958) in "Dance Rituals of Manipur". Thang-Ta is almost completely unknown today outside Manipur. In India itself, the art is not well known, although a documentary was broadcast on Indian television in 1994. "Unfortunately, opportunities for Westerners to study Thang-Ta are very limited. Travel to and from the region is restricted - few, if any, people outside of Manipur are able to study the art because of the Indian Government's entry restriction. To our knowledge, Khilton Nongmaithem (of HULA SINDAMSANG, IMPHAL) is the only Manipuri teaching Thang-Ta outside of Manipur." Three warriors - Paona Naol Singh, Ningthoukhongja Poila, Loukrakpam Sana Mityeng each founded a distinct style within the art of THANG-TA. Paona died fighting the British and is still regarded as a hero in Manipur. At the start of the sword drill, stand with feet shoulder width apart; turn to the left, pivoting on the balls of both feet. The feet should form an approximately forty-five degree angles. Lean forward until the toes of the left foot are aligned with the knee and the chin. Your body should form a straight line from the back of the head down to the right heel. This is called the "Lion's Posture" or basic stance. The unarmed aspect of Thang-Ta is named SARIT-SARAT. Traditionally, it is taught after competence in weapons was gained. It uses footwork and handwork form the weapons forms, with a liberal dose of the native wrestling style (MUKNA) thrown in. Although the Manipuri Agricultural communities were in contact with great civilizations of India, China and Southeast Asia for thousands of years, the relative isolation of the region allowed the development of a unique cultural tradition that includes a distinctive form of martial arts using the sword and spear. Originally, training in the martial arts was essential for the overall survival of the community, as well as for initiating the youth into the subtleties of religious knowledge and practice. However, over time, the martial arts were separated into two schools for training, one for actual combat and the other as ritual dances that served to reinforce Manipuri cultural identity and played an important role in the physical and spiritual growth of the students who studied it. Traditionally, most Manipuris were agriculturist, but the kingdom of Manipur did not have any need for a standing army as every able bodied man (and if necessary woman), was a warrior and most were skilled in swordsmanship or spear fighting. - "The most memorable performance with the sword involved in a blindfolded swordsman and a man lying on his back with five pieces of melon balanced on various parts of his body. A wedge of melon was place on each knee, as well as in each hand, and a single wedge was precariously balanced between his chin and his chest, directly above the throat. The swordsman was blindfolded using a piece of cloth filled with sand, so that everyone could see that there was no way for him to peek through the cloth. After being blindfolded, the swordsman would begin a rhythmic chopping and prancing in place, while a third person took up a position directly opposite the swordsman. In the middle was the man lying with melon slices balanced on various parts of his body. Drumming and cymbals accompanied the whole act and the third man would begin chanting, in order to provide the blindfolded swordsman a directional cue. Suddenly, the swordsman would surge forward, leaping and chopping in a very precise pattern. As he leaped over the man lying in his path, his sword deftly cut each piece of melon, including the piece directly over the man's throat. Every spectator was tense with expectation until the man lying on the ground would jump to his feet and the swordsman would rip off his blindfold. As people shouted their approval and clapped their hands, many would throw coins and currency notes into the stage in appreciation of this spectacle." This is one of Manipur's most ancient martial arts. The fighting equipment comprises of a sword and a shield, now modified to a stick encased in soft leather and a shield made of leather. The contestants fight a duel, and victory goes to the person, who scores the maximum points. In ancient times, sword and spears were used by the contestants. Victory in this martial art, depends more on skill, than brawn and brute force. The competition is held on a flat surface, within a circle, with a diameter of 7 meters. There are two lines of one metre length each in the circle, with a space of two metres between them. The 'cheibi' stick is 2 to 2.5 feet in length, and the shield is 1 metre in diameter.